How did a first-year pitcher with a 3-11 record and a 5.70 earned run average in Single-A baseball make it to the major leagues the very next year? Right-handed pitcher Dave Gray was 20 years old in 1963, pitching in Iowa for the Waterloo Hawks that year. The next year he was pitching for the Boston Red Sox. And not only did he never lose a game for the Red Sox, he also sported a career batting average of 1.000 and a career fielding percentage of 1.000. He graduated from Ogden High School and put in a half-year at Weber State College, also in Ogden. He clearly had a special talent and was signed to play professional baseball by scout Charlie Wallgren of the Boston Red Sox. The Red Sox seem to have depleted their own stock of prospects. Tim Horgan wrote in the Traveler, “The Sox apparently got so tangled up in the new major league draft rule they came close to losing their present and their future. Not only were they relieved of seven young pitchers in the draft but they had to load up their bench with greenhorns or forsake all hope. The only way the Hose could salvage what remains of their farm system was to put four first-year players on their 25-man varsity roster. This means their chances of rising out of seventh place rest upon Swampscott’s Tony Conigliaro, Pete Charton and Dave Gray. That’s not exactly good.”3 All three — and Tony Horton — were “first-year players.” As Joe Cashman explained, “That means they must be kept with the club for the entire season if the Sox want to make certain of keeping title to them.”4 They were entering the season with 21 players on the roster, and four prospects they didn’t want to lose. That fall, Gray worked in the Florida Instructional League to benefit from additional tutoring. In a March 4 intrasquad game at Scottsdale, Gray struck out seven. He began to suffer what seemed like tonsillitis at the end of March; the symptoms continue to bother him and, on May 24, he had a tonsillectomy in Boston. Manager Johnny Pesky gave him his first taste of major-league baseball in the first game of the June 14 doubleheader against the visiting Baltimore Orioles. The game was pretty much a lost cause, with the O’s leading, 8-1, after eight innings. Gray pitched the top of the ninth. He struck out Jerry Adair, the first batter he faced. A single and a stolen base followed, but then Gray struck out another man. A walk and an infield single loaded the bases, and Sam Bowens singled in two, with the third baserunner thrown out at home plate. In his second outing, on June 20, Gray pitched 3 2/3 innings and only surrendered one base hit. He struck out four more batters, but he walked five and gave up three runs on a single, sacrifice fly, and an error. Gray pitched in the two June games, two more in July, three in August, and two in September. The Red Sox lost every one of the nine games, scoring a total of 31 runs while giving up 94, 20 of them charged to Gray (seven unearned) in his 13 innings of work. The only appearance in which he didn’t give up at least one run was in Yankee Stadium on August 30. With 13 earned runs in exactly 13 innings, he finished the season with an ERA of precisely 9.00. It might have been higher; in the September 4 game against the Twins, he worked one inning and gave up five runs, but all five were unearned. His final appearance was a start, at Fenway Park against Kansas City on September 14. He lasted just an inning and a third, giving up four runs on five hits and three walks, but did not bear the loss in the 7-6 game. All in all, Gray struck out 17 batters in his 13 innings, but walked 20 and gave up 18 base hits. He didn’t win a game in the big leagues, but he hadn’t lost one, either. It was during the 3 2/3 innings on June 20 that Gray had his only big-league plate appearance. He was the second batter up in the top of the seventh, and singled to left field off Baltimore’s Milt Pappas. Dalton Jones struck out as did Tony Conigliaro; Gray was thus left on first base. Gray was presented with three fielding chances, one in that game and one each in the two July games. He picked up an assist each time. After the season, Gray did say that he had picked up a new delivery from Turley, “so the year hasn’t been a total waste.” He was rated, said the Boston Globe, “among the finest young — he’s only 21 — pitching prospects in baseball.”6 He returned to Utah to attend college over the winter. Come 1965, Gray was the first player cut in spring training (by design), sent to the minor league camp in Ocala, Florida, on March 5. He had married the day before reporting to Scottsdale, and was given a week to return to Ogden, collect his bride, and head for Florida. In September, the Sox exercised their option to keep him under contract to the team. Over the wintertime, he continued his college studies. He spent the full 1966 season with Winston-Salem and struck out 145 batters in 110 innings. In the first game of an early May doubleheader, he got 16 of the 21 outs on strikeouts in the seven-inning game. He still had serious control problems, walking 124 batters on the season. On the final day of the season, he threw a two-hitter to beat Greensboro, 3-1. His record was 6-11, 4.75. The Red Sox dropped him from their roster, and he sat out the 1967 season. 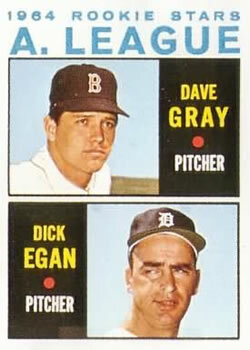 Gray was invited to spring training with Boston again in 1969, but about three weeks before the end of the exhibition season he was sent to Pittsfield again. Though he had a very late start due to arm trouble, once he got going in late June, he threw a 5-0 win against Elmira (a game The Sporting News said took only one hour, 30 minutes to play).12 He had another good year there, with a 2.84 ERA and a 5-4 record, but again worked fewer than 80 innings. Despite working rather little, sportswriters named him to the league all-star team.13 And he devoted time to working in the Florida Instructional League once the Eastern League had wrapped its schedule. Records show he struggled there, however, with a 5.46 ERA and control problems (27 walks compared to 25 strikeouts in 28 innings). In addition to the sources noted in this biography, the author also accessed the Encyclopedia of Minor League Baseball, Retrosheet.org, and Baseball-Reference.com. Thanks to Rod Nelson of SABR’s Scouts Committee. 1 Author interview with Dave Gray on December 16, 2017. 2 “Sox Drop Five, Add 6 Rookies,” Boston Traveler, October 1, 1963: 49. 3 Tim Horgan, “Sox Facing Dismal Season,” Boston Traveler, December 4, 1963: 64. 4 Joe Cashman, “Sox Have 6 New Faces for 1964 Campaign,” Boston Record American, April 12, 1964: 19. 5 Gray talked a fair amount about what they were trying to learn in Clif Keane’s article “Red Sox Kid Pitchers Not Wasting Their Time,” Boston Globe, July 12, 1964: 69. 6 Mark Mulvoy, “3 Rookies Reject Instructional Loop Bids,” Boston Globe, September 6, 1964: 86. 7 Associated Press, “Elmira Again Beats Pittsfield For, 3-1,” Springfield Union, June 21, 1965: 16. 8 Author interview with Pete Magrini on December 14, 2017. 9 Dave Gray interview on December 16, 2017. 10 Fred Ciampa, “Talent Abounds On Sox Farm,” Boston Record-American, July 21, 1968: 16. 11 Peter Gammons, “Sox Farmhands Impress Scout Brown,” Boston Globe, December 1, 1968: 103. 12 “Eastern League,” The Sporting News, July 12, 1969: 46. 13 “Eastern League,” The Sporting News, August 9, 1969: 40. 14 “Pads Release Gray,” The Sporting News, July 25, 1970: 36.